I took this pictures in Cascavel, Parana South Brazil on Feb 3 at 8:00 PM (summertime). At the time the sun still in the horizon (bottom photo) but I could saw this star, then I shot these 3 photos, the light from it was so strong I could saw even in day light. Its light was stronger than moon or any planets or stars at the moment. We observe this "planet" is already in the solar system because his mass is visible, its not a point of light. We could see its ethereal mass. Another detail. we have observed in the telescope or in the photographic camera (1000mm) his movement in the sky was 60% faster than any star, moon or planet. I took a chronometer to take the time, these start took 2.50 minutes to cross the photographic frame (pentaprism). Are these shots about the X Planet? Venus is still visible at 8:00 PM, setting in the West. 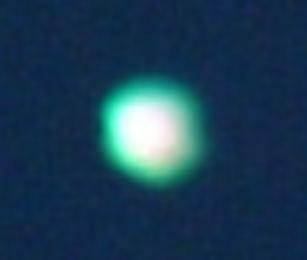 But as the photographer then photographed this object after Venus sets, at 10:00 PM, it is unlikely to be Venus. Also, the tracked motion indicates it not to be a known planet orbiting the Sun, but another object closer to Earth, thus the speed of transit more noticeable. 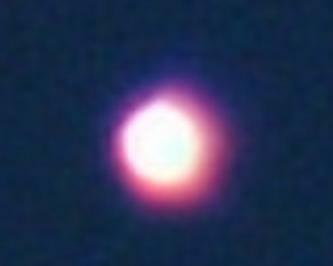 Note the close hugging dust cloud of Planet X, evident in these photos. 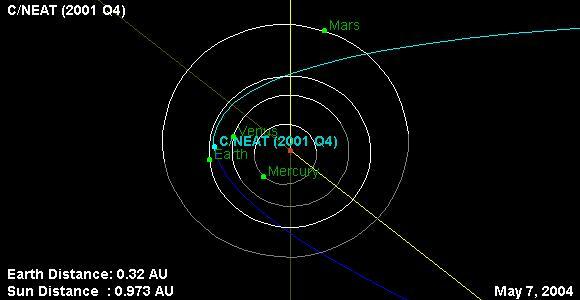 Note per the IAU observations of C/2001 Q4, comet NEAT, that this is the most likely explanation. 2003 Nov 02.37 UT: m1=11.5, Dia.=1'.0, DC=7/9...41cm L (214x)...John Drummond, (Gisborne, New Zealand) [Q4 easily seen despite the 7 day moon. It appears to have a bright, tight nucleus surrounded by a decent sized coma - resembles a small compact globular cluster]. 2003 Dec 14.45 UT: m1=9.8, Dia.=1'.7, DC=6/9, Tail=5'.0 PA 62*...20cm L (26x)...John Drummond, (Gisborne, New Zealand) [Through the 16" I can see a compact, fairly stellar nucleus surrounded by a largish coma. The tail is faintly seen extending for about 5']. 2003 Dec 15.40 UT: m1=9.8, Dia.=1'.7, DC=6/9, Tail=4'.0 PA 65*...20cm f4 Reflect (37x)...John Drummond, (Gisborne, New Zealand) [Through the 16" I can see a compact, fairly stellar nucleus surrounded by a largish coma. The tail is very faint].